We are a genuine working farm…we have angus cattle grazing in our fields, top notch wine production, a wine-tasting room open seven days a week, distinctive wine tasting events and educational seminars ….plus a Farmstay B&B! Visit and you experience everything authentic about the eastern shore of Maryland, and glimpse into a new chapter of agricultural prosperity on the mid-Atlantic. We are open year-round and welcome your visit. Read what our visitors say about the authentic experience here. Take in one of our “Farm to Table” events at our farm and not only experience wines from grapes growing beside you in our vineyard but as well deliciously cooked Crow Grass-fed Angus Beef and other foods from our local partners. We actually like to say we offer “Farm Table” events because the foods and wines are coming right from our farm or from down the road and you are enjoying foods right in our Haybarn. Farmstay B&B with us and you’ll experience what a truly authentic farm breakfast can be prepared by Owner Judy Crow. Immerse in farm life...Farmstay with us! Take in one of our “Farm to Table”events at our farm and not only experience wines from grapes growing beside you in our vineyard but as well deliciously cooked Crow Grass-fed Angus Beef and other foods from our local partners. 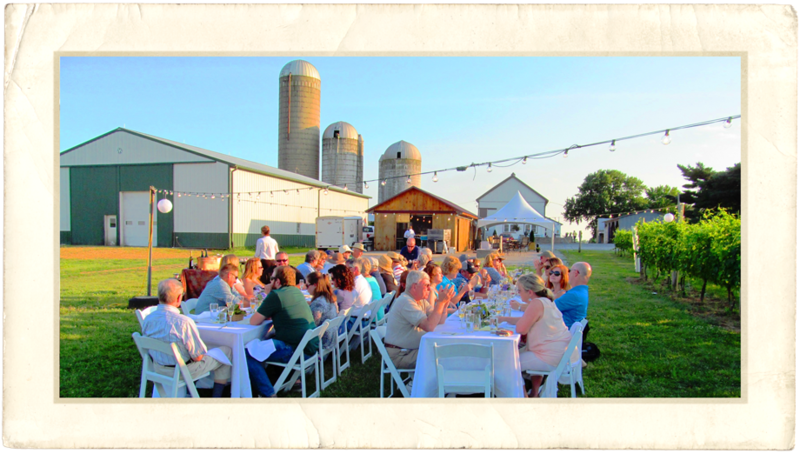 We actually like to say we offer “Farm Table” events because the foods and wines are coming right from our farm or from down the road and you are enjoying foods right in our Haybarn. Farmstay B&B with us and you’ll experience what a truly authentic farm breakfast can be prepared by Owner Judy Crow. We’re only fifteen minutes from historic Chestertown. Enjoy our wine tasting room and then head to Chestertown for dinner OR spend the day in Chestertown and then Farmstay B&B with us. View our location. Help us sustain our farm. Your visit to our winery and purchase of our wines and other products supports us in many ways. As a volunteer at harvest or a wine club member you actively support the future of our farm and its authentic roots. Walk the vineyard and our farm trails. Walking our five plus miles of expansive farm trails are a great way to combine physical exercise with your visit to sip our wines. 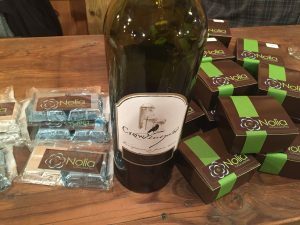 We sell Crow Vineyard & Winery mementos, mugs, t-shirts plus local artisan wares in our tasting room. And or course you can buy our wines and our grass-fed beef too! Or shop online. Visit our wine tasting room anytime noon to 5 pm. We have knowledgeable staff serving you in our wine tasting room. Hospitality is important so Owners Judy and Roy Crow always make an effort to greet visitors when they can and share their story. The photography on this site is created by Loblolly Productions unless otherwise noted. We thank our photography partners as they create the essence of our brand. 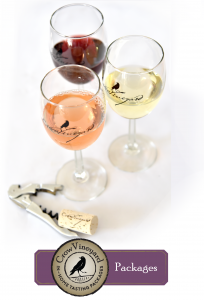 Receive invitations to events, farm and winery news, wine shop info and more!